The U.S. government classified more than 14 million new national security secrets last year, up from 11 million in the previous year and 8 million the year before, according to the new annual report to President Bush from the oversight office for the national security secrecy system. Dated 31 March 2004 and made publicly available last week, the report provides the Information Security Oversight Office's best estimate of the rising tide of secrecy, and also warns that "Allowing information that will not cause damage to national security to remain in the classification system, or to enter the system in the first instance, places all classified information at needless increased risk." 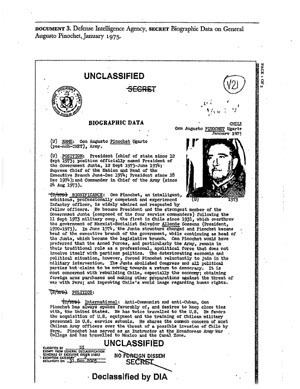 The National Security Archive today posted on the Web one of the 14 million new secrets, a Biographical Sketch produced in 1975 by the Defense Intelligence Agency on the Chilean then-dictator, General Augusto Pinochet. 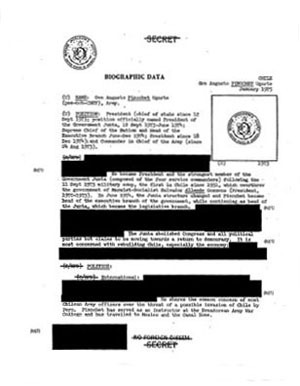 The DIA blacked out large sections of the Sketch on ostensible national security grounds, including General Pinochet's liquor choices - "scotch and pisco sours" - when DIA released the document under the Freedom of Information Act last year. 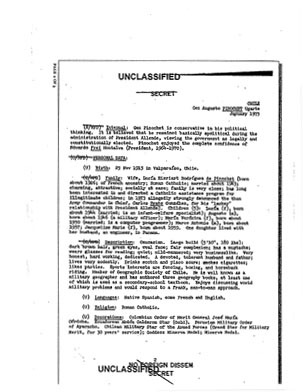 Also posted today is the Pinochet Sketch as released in full, with no deletions, by President Clinton's 1999 declassification of U.S. documents related to human rights abuses in Chile. 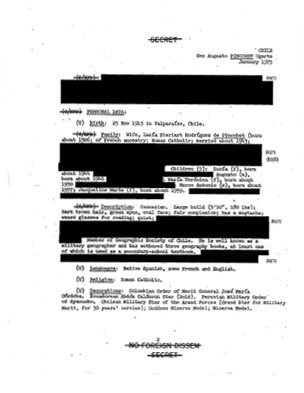 The document appears uncensored on pages 181-183 in the Archive book, The Pinochet File: A Declassified Dossier on Atrocity and Accountability, by Peter Kornbluh, which was published this past September by The New Press, New York, and was selected by the Los Angeles Times as a "Best Nonfiction Book of 2003." "Pinochet's pisco sours are certainly not the only dubious secret among the 14 million new ones," commented Archive director Thomas Blanton. "The real question is whether the secrecy veil really makes us safer, or does it hide our country's vulnerabilities and policy problems when what we need to do is fix them?" The Pinochet Sketch is also the subject of today's "In the Loop" column by Al Kamen of The Washington Post, under the headline "Millions of Secrets."